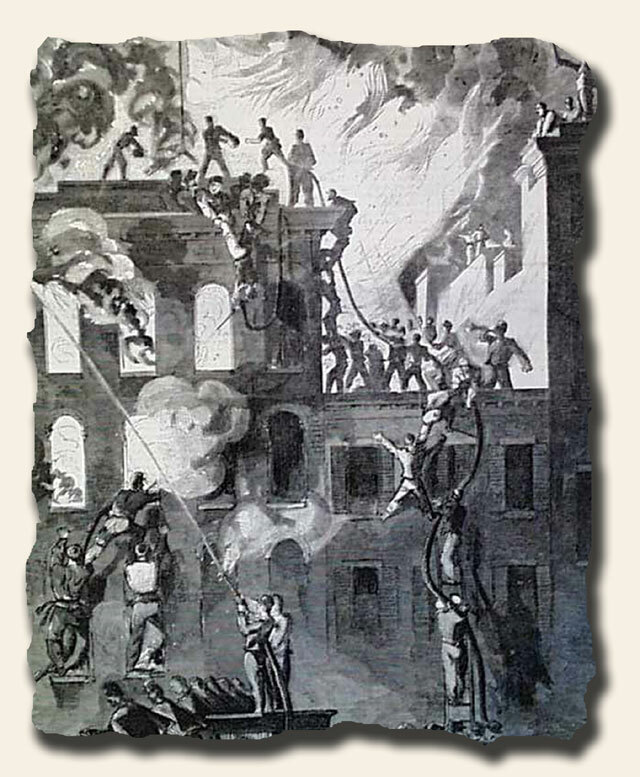 Today’s issue, dated May 25, 1861, has the entire front page taken up with a a very dramatic fire at Willard’s Hotel in the nation’s capital, showing the New York Fire Zouaves working feverishly to t out the blaze. One firemen is being held by his legs as he is suspended upside down with a fire hose! Other prints inside deal more with the war, including: “Camp Cameron…” from Washington, D.C., a nice print of “Evening Parade at Fort Pickens…” which provides a nice overview of the fort. Another print shows troops leaving from Dubuque, Iowa, aboard two of the large paddle wheeler boats which ply the Mississippi. The interior of the rotunda of the Capitol in Washington shows a Mass. regiment resting there, with support braces for the construction work going on evident. I understand the new dome is in the early stages of completion. A full page print shows: “The 79th Regiment (Highlanders) ” of the New York Militia marching down the street in kilts! What a sight! And there is also an impressive full page print of “Camp Scott, York, Pennsylvania” showing many troops encamped there. Yet another page has a map of the United States showing the strategic routes in the interior of the country. I always look forward to maps concerning the war as they provide a perspective which makes the battle strategies in the various parts of the country more understandable. “This week’s edition has many prints on the Civil War, just as I was hoping. Reading the reports in the daily papers I looked forward to see what was happening. The front page has a nice view of “The Confederate Batteries Opposite Fort Pickens, Florida” which shows the formidable size of the fort. An inside page has an interesting 5 panel print of “Commander Dahlgren, U.S.N. and the Dahlgren Gun”, a cannon mounted on wheels. It’s interesting that they take a full page to show a print of “The Washington Navy-Yard with Shad Fishers in the Foreground”, but what I found most interesting is the partially completed dome of the New Capitol building under construction in the nation’s capital. It would seem to be the tallest structure in town! “The daily papers today give evidence of what everyone feared: war has begun. Events in Charleston harbor reached a breaking point as both the North and the South claimed the military installations there. But our “Harper’s Weekly” is about two weeks late with reports which I understand is due to the complexity of providing accurate illustrations of the events, certainly a small price to pay for the great benefit of “seeing” the war scenes. I look forward to the end of the month and seeing just what transpired at Charleston. In the meantime today’s issue has a scene of Point Isabel, Texas, a town apparently on a cliff along the Gulf of Mexico. In the foreground troops are being transported on a paddle-wheeler. Near the back are two military scenes including a boat house at Fort Pickens, Florida, and another the inside of that fort. The cannons they use are huge and the fort’s thick walls seem impenetrable. I had not previously known what the inside of a fort looked like. I recognize President Lincoln in one of the back page cartoons, his face and stature familiar from an earlier issue on his inauguration. In this cartoon he consults with “Columbia”, who says: “…be sure you’re right, then go ahead!” Yes, our future is in his hands.” With all of the tension in the air, I was surprised to see the double-page centerfold which included various vignettes of American Home Scenes, which seemed in stark contrast to the mood of the day. With the 150th anniversary of the outbreak of the Civil War just days away, we begin today a weekly feature of reflecting upon the appropriate 150 year old issue of “Harper’s Weekly” from the perspective of a subscriber in 1861. The success of “Harper’s Weekly” was in presenting illustrations of the war, as visual presentations–today commonplace in almost all forms of media–were almost unknown in the mid-19th century. The subscriber in 1861 could now “see” rather than just read about the battles and the famous names who lead the war effort. We hope to share with our blog readers that novel experience and how those in 1861 would have reacted as they opened their issue of “Harper’s Weekly” . I always look forward to my “Harper’s Weekly‘ issue in the mail as this new type of newspaper provides the graphics of everyday life which my daily newspapers don’t provide. What a treat it is to see what is happening rather than just read about events of the day! Today I received the April 6, 1861 issue, and as per usual, the prints were outstanding. The front page is a nice illustration of the “Hon. William H. Seward, Secretary of State” about whom I’ve heard much as a key member of the new Lincoln Administration. He looks much younger than his 60 years the article mentions. Other prints inside provide military scenes concerning the inevitable crisis between the North and South, with a print of Fort Pickens in Florida, another of Pensacola Harbor, a nice doublepage spread of various “Virginia Sketches” one showing the huge Richmond Armory & another the frigate Merrimac–a mammoth ship which would be a formidable foe in any naval conflict. A full page is taken up with the “Coats of Arms of the Several States of the Union” which make a fascinating display with their various themes and mottoes. How many will still be part of our Union if war breaks out? With rumblings of war noted in the daily newspapers I suspect more war-themed prints will find their way into my future editions of “Harper’s Weekly“. I look forward to the illustrations which will put a “face” on the news reports.